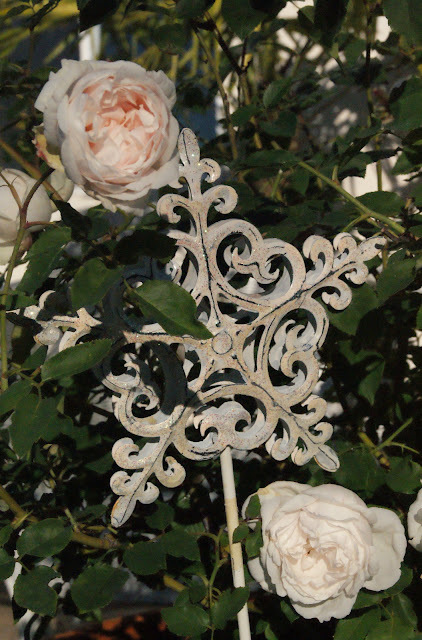 The weather is grey and dreary right now and I am not in the mood to garden, even though the roses are begging me to be pruned to get ready for spring, again. So I thought instead of forcing myself to go out in the yard. I better finish the year by writing one more post about our trip to England at the end of May this year. 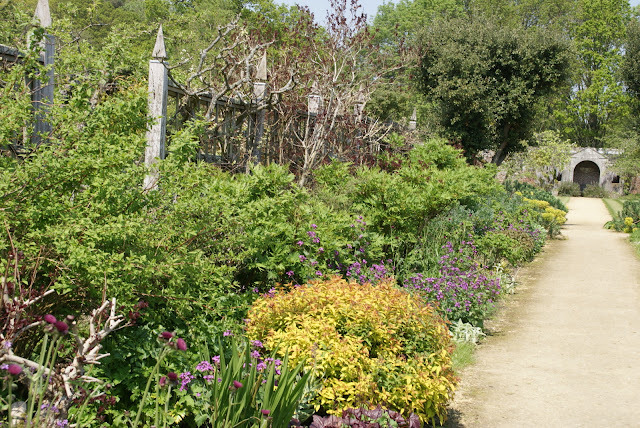 One of the first estates that we were visiting during our vacation was Parham House and Gardens. Parham is something very special and if you are in the area make sure you don't miss it. The day we visited, the weather wasn't the best either, it was quite hazy in parts, but I will never forget the impression the grand estate made on us. First you need to drive through a deer park before you see anything of the estate. This alone is an experience by itself. Then you drive around one more corner and suddenly there it is: The Parham House. I can't imagine how the peope must have felt who lived here and owned the house, when they were approaching their home. Do you get ever used to such grandeur? From the outside Parham House is certainly impressive, but it doesn't feel necessarily welcoming or friendly in terms of the architecture. At least that is the way I perceive it. It feels more like a huge house that leaves a first time visitor speechless staring at it with the mouth open just because of its humongous fortress like appearance that demands attention and respect. Inside however it comes across in a very different way and is well worth a visit. There are many interesting antique furniture and the rooms are quite beautiful. Especially memorable is the Long Gallery. So I would recommend if you visit bring plenty of time to see the house, the gardens and maybe even the extensive park and leave some time to rest and have lunch or tea in the 16th century Big Kitchen. Scene of the ancient deer park of 300 acres that surrounds Parham House and Gardens. The park is very beautiful with rolling hills and lovely trees and I am sure it is worth a walk, but unfortunately we didn't have the time for it. 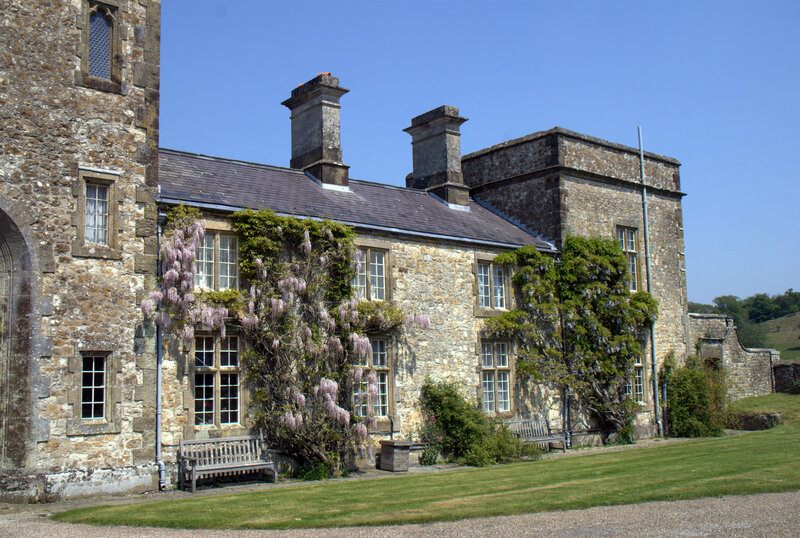 To the left side of Parham House is a chapel that belongs to the house. I love how it is surrounded by ancient trees. As you can see on this photo Parham House estate is much bigger than "just the main house". There is actually a complex of outbuildings attached. The foundation stone for Parham has been laid in 1577. Since then it has been only owned by three families and was always a private home. 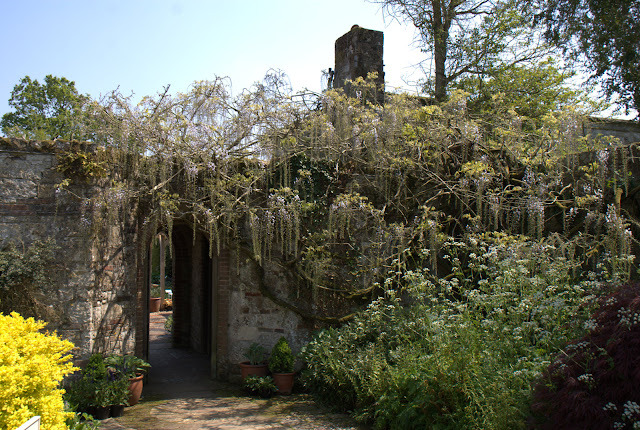 It was opened to the public in 1948 for the very first time, because the owners wanted to share the beauty of Parham with visitors. 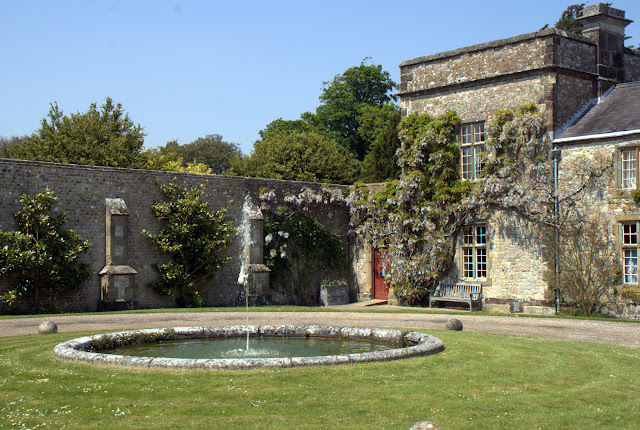 Now Parham is owned by a Charitable Trust but one family member, Lady Emma Barnard, is still living there with her family. This photo shows a kind of courtyard that is located between the entrance to the main house on the left side (not visible on this picture) and the outbuildings to the right. ...soften the hard surfaces and making them more friendly. 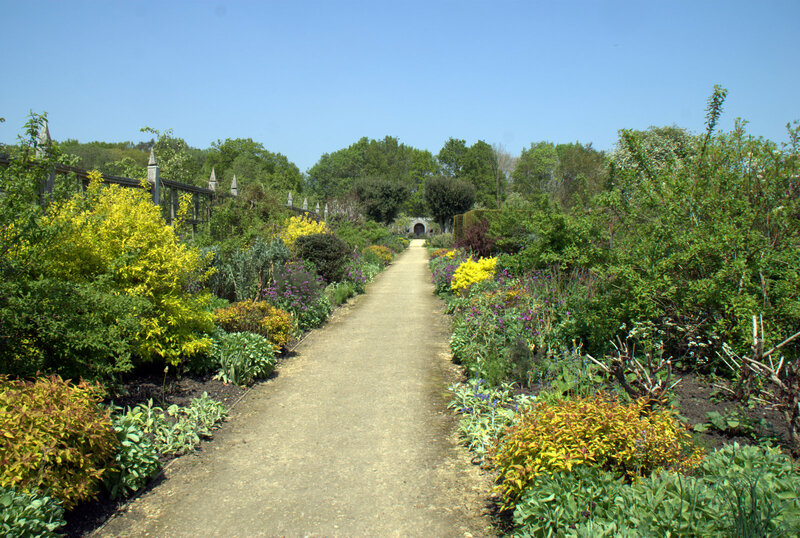 When we entered the gardens this was the first view we got. A most impressive very long double border planted predominantly in the colors of yellow and purple interspersed with green leaved plants. 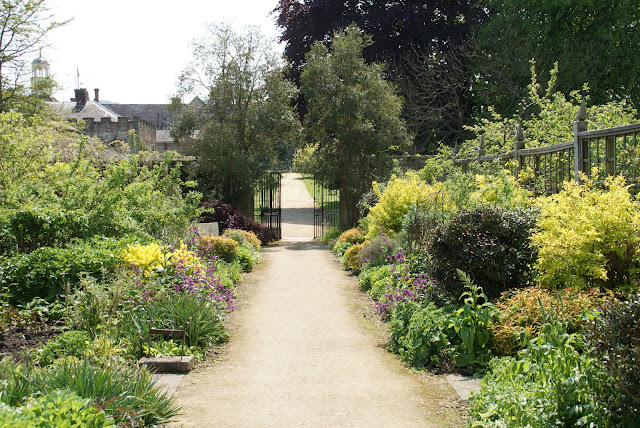 This is the entry to the right of the long border to the estate nursery. Lucky people, who live close by and can bring a plant tressure home with them. In the long border there were many interesting and beautiful plant combinations worth having a closer look. 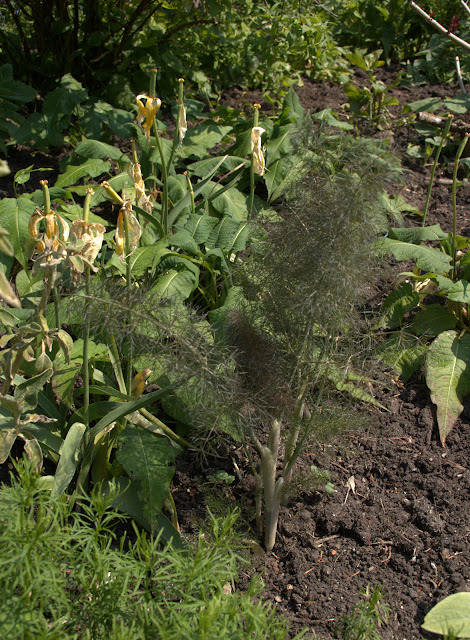 I loved this one of the purple flowering plant, which I don't know the name of, and the bronze fennel. 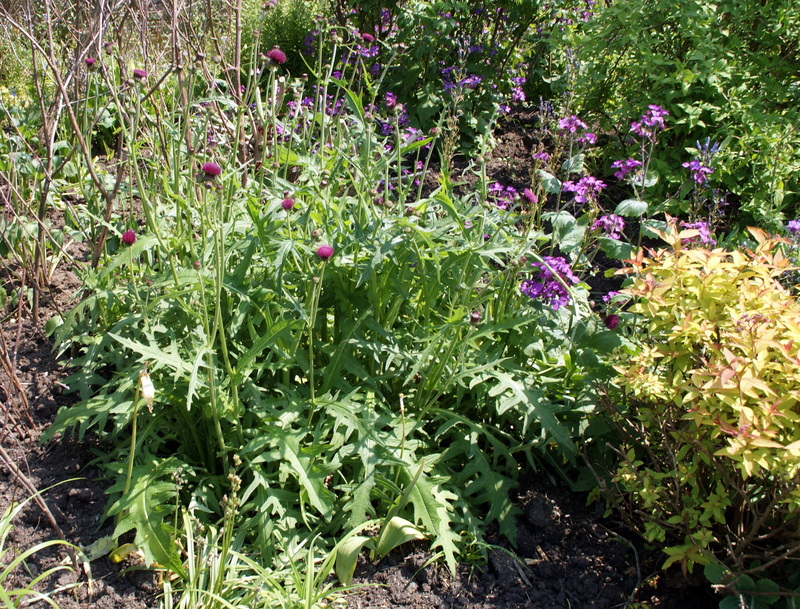 As always, dear readers, please feel free to identify a plant if you know it. 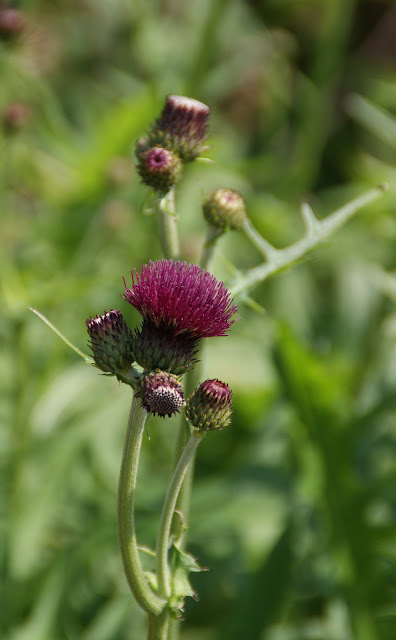 Beautiful crimson thistle like plant. Same plant surrounded by companions. Again, I love the yellow, purple and crimson color combination. The tulips had been over but the fennel was coming on strong. 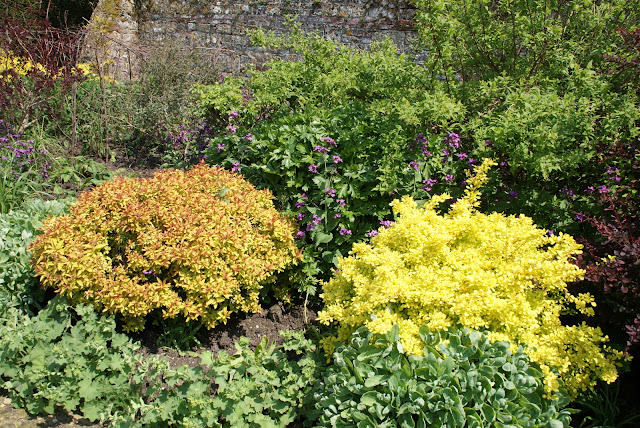 What was interesting is that the yellow color was brought into the border not by flowering plants but solely by yellow leaved plants. Smart idea that can inspire! Parham Gardens contained many lovely sculptures like this one. Isn't it adorable how the old stone statue is surrounded by the yellow leaved shrubs? I really liked the wooden climbing structure that served as a divider between the double border and another garden room to the left. If I remember correctly behind the visual divider was a fruit orchard. 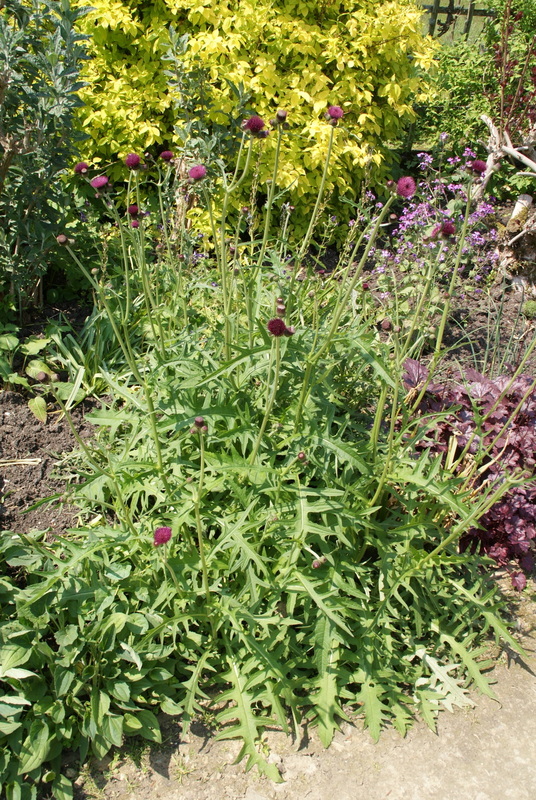 and the crimson blooming thistle with again a yellow leaved plant in the background. Looking back into the other direction towards the entrance to the double yellow and purple border. I think that these beds are masterfully done and you can learn a lot by carefully observing how they were planted. I appreciated that plantings were very unobtrusive, but at the same time there was a lot of interest and pleasure to find for the eye. 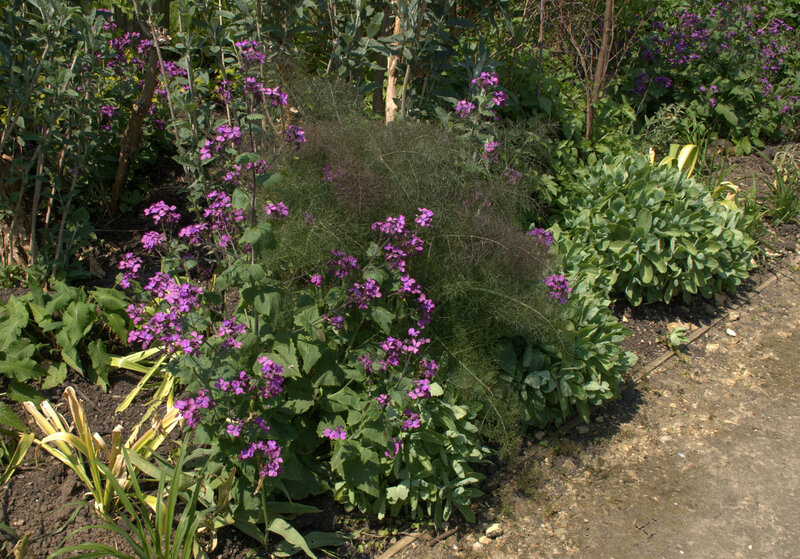 I hope you enjoyed seeing this border in my photos as much as I did by putting this post together. The Parham Gardens were to big to cover them in just one entry. So I will continue to show you more of this lovely place in another post soon. 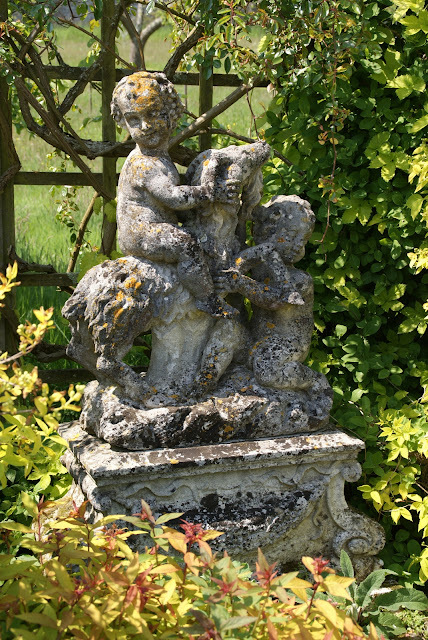 Besides the plants themselves, one thing that stood out for me in this garden was the exceptionally beautiful statuary that was tastefully scattered throughout the estate. 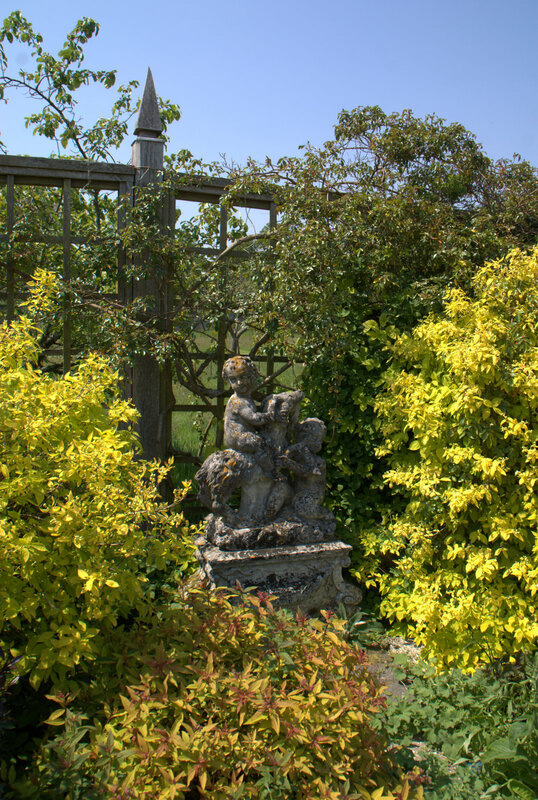 The statues added so much to enhance the overall enjoyment of the gardens and sparked my desire to place one in my own small garden. If I only could have a statue similar to those at Parham for my own little paradise! They are so much more beautiful and have so much more character than the poured concrete sculputres that you can find in garden centers in the US. Of course I am sure they come with a very different price tag as well, but to me it is worth saving for a beautiful, quality statue for years, than getting a cheap unsatisfying one right away. Eventually I will get there! Just want to pause for a moment and sent out my warmest holiday wishes to everyone, who is reading my blog! And if you are celebrating Christmas, of course, Merry Christmas to you! I hope you have a wonderful time with friends and family. May there be lots of moments of peace, joy, happiness, and love, which I feel it is all about. My husband and I we are celebrating Christmas today on Christmas Eve already as it is the tradition in Germany. 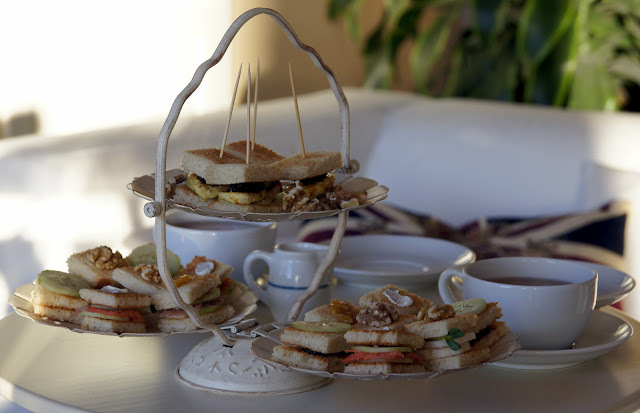 It will be an intimate afternoon and evening with an English Afternoon Tea follow by a cozy dinner later at night. As you can easily see in our home today it is all about good food and spending quality time together! 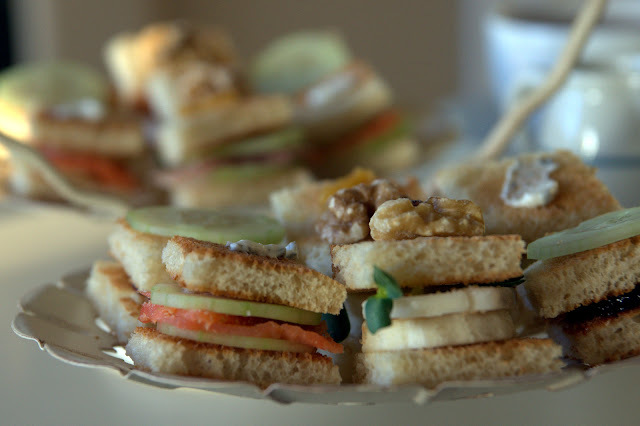 I better finish this post now, since the tea sandwiches on the photos were from yesterday and are long gone! Today we will be having a special kind of scone, which I baked already, but the sandwiches and other little palate teasers still must be prepared (my husband's specialty) and the table needs to be set up nicely (my job)! One more thing I would like to share with you. I am most excited about my early Christmas gift: Eight 3' x 2' holes and three more areas, where sprinklers have been put in. Yay! One hole is already filled with a hydrangea, which we planted yesterday. I hope to show you photos very soon. 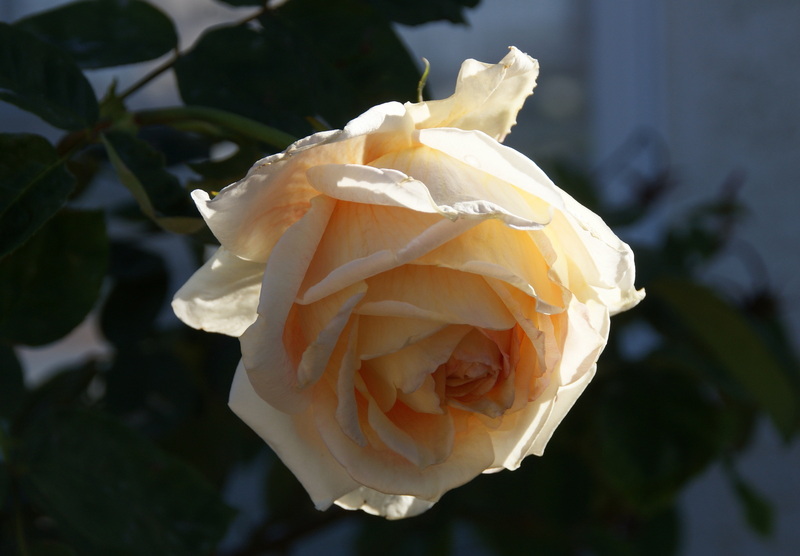 The rose that you can see in today's photos is 'Madame Alfred Carriere'. I potted her up into a big terracotta container lately, fertilized her, and she is blooming like in spring. I can't believe that another month has passed since my last blog entry. My life continued to be very busy and another trip, this time a private one to Germany to visit my eighty year old mom, left no time for blogging. It was so nice to see her, but unfortunately the whole time I was there I had a nasty cold, which was quite a bit of a drawback, since I had to rest a lot and couldn't do too much. Since yesterday night I am back home and enjoy the mild Southern California autumn temperatures in comparison to the freezing cold in Germany. I hope that with the year coming to an end the pace of my life will become a little slower, leaving me with more time to post and also to stop by my favorite blogs and read about what is going on in other people's gardens and life. 'Nimbus' has to come first in the post, since it was my very favorite rose in November. 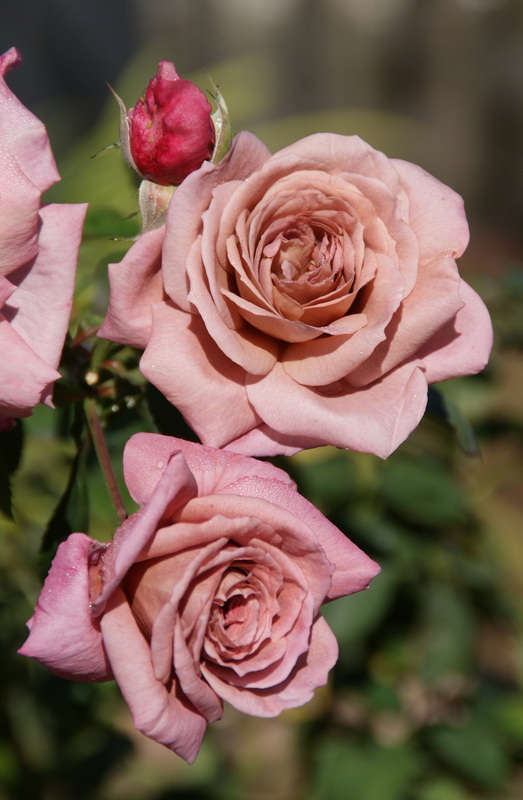 The color is so unusual, unlike any other of my roses and even unlike any rose that I have ever seen in person. 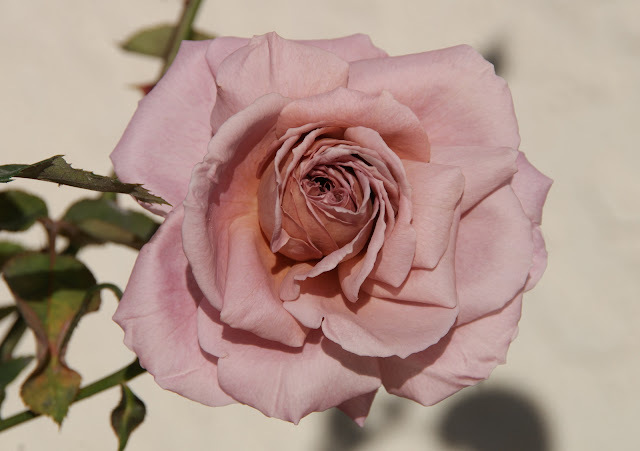 I would describe it as a mix between a smokey rose pink, brown, mauve and lavender. It is not stable but varies with the weather, which I find adds to the charm of this rose. Who doesn't like a surprise? 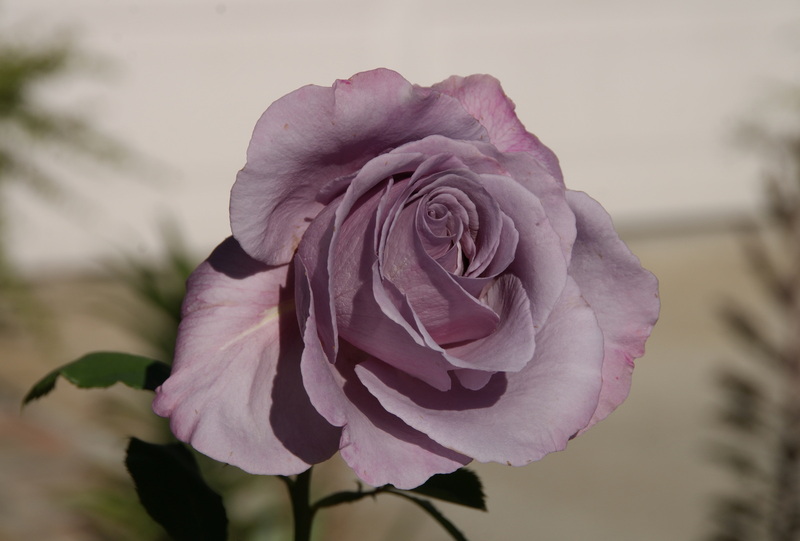 Unfortunately 'Nimbus' mildews like many other roses in the lavender/mauve color range, but not too bad so far and only under certain weather conditions. 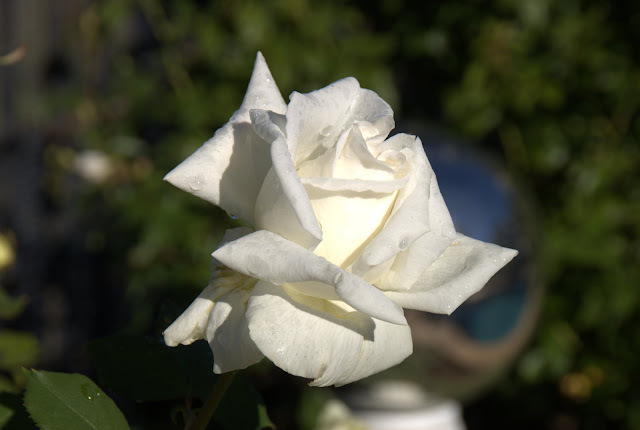 I hate mildew and I am slowly getting rid of roses that reliable show this fungal disease in my garden, but this one I will keep because it is so special. I even caught myself thinking about spraying it (organically of course! 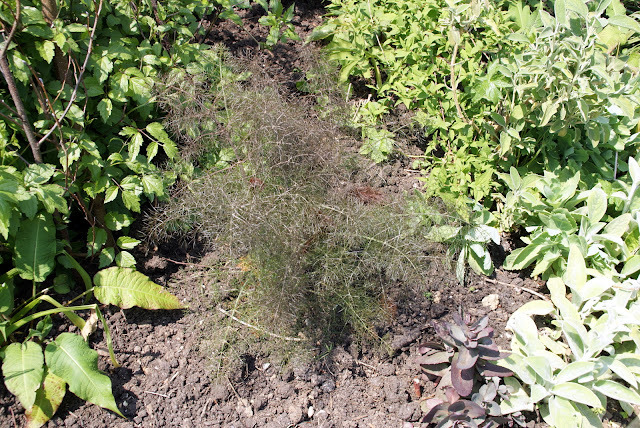 ), which is really unusual for me, since I am a convinced no-spray gardener up to now. This is the last bloom of 'Halloween' for this year. The rose flower is much less orange than when the temperatures are warmer and I like the more subtle coloration very much. The flowers of the Hybrid Tea rose 'Sweetness' showed almost an ash-gray lavender in November and I think the color is to die for. Here is another photo of 'Sweetness'. 'Pretty Jessica' is producing reliably beautiful blooms in a very difficult and shady location in my front yard. I had a gardener trim yellow fronds of our Queen Anne Palms and one crashed right into this poor rose and broke two new strong basal canes with flower sprays. It was really upsetting! But the rose continued to bloom and hopefully will recover from this accident. I finally have faced the reality that I have too many roses in my pot ghetto to ever have the chance to get them planted in our garden. Our lot is way too small and on top of that in Southern California the roses get really big and therefore you have to give them space. So as hard as it is for me I decided to part from some of the roses that are still waiting in containers. 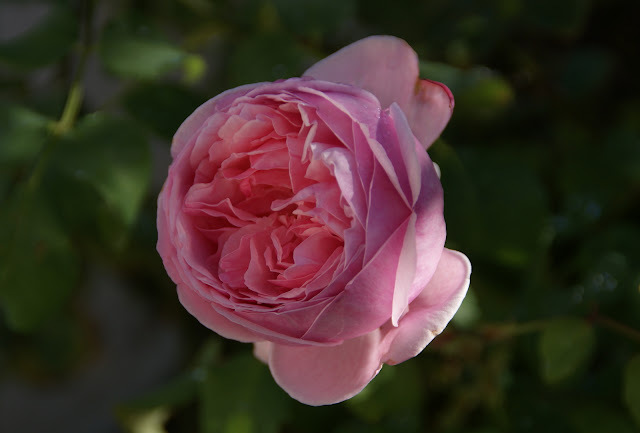 This is one of them, 'Madame Melanie Willermoz', a relatively rare Tea rose. 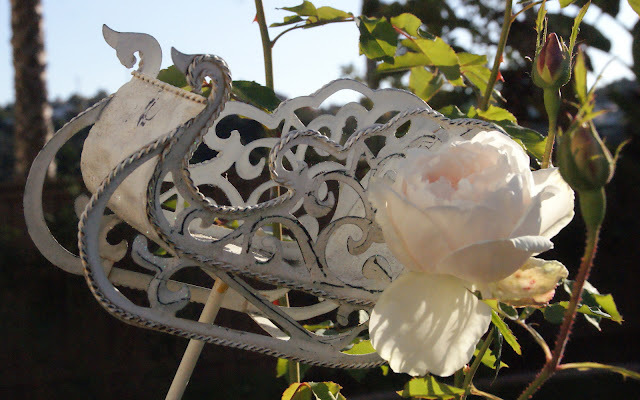 She went with a friend of a friend, who seems to love roses and plants in general and I hope that this rose will grow into a beautiful rose bush in her garden. An open spray of 'Pink Pet'. I wasn't sure if I like this rose or not, but I have to say it has really grown on me. 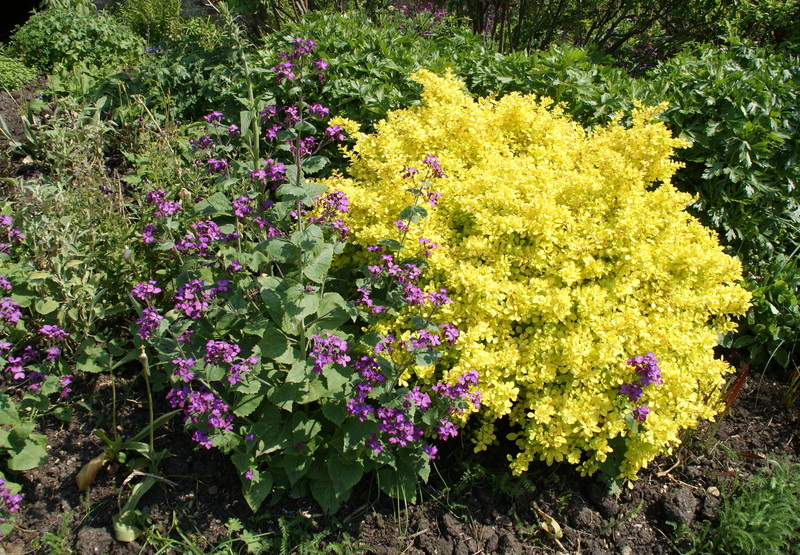 It is planted in a very difficult area in the front yard and blooming its heart out. No disease whatsoever on the foliage. Could become a winner in my garden! This is 'Auckland Metro', a cream Hybrid Tea rose bred by Samuel Darragh McGredy (1987) in New Zealand, which I believe I have not shown on my blog, yet. 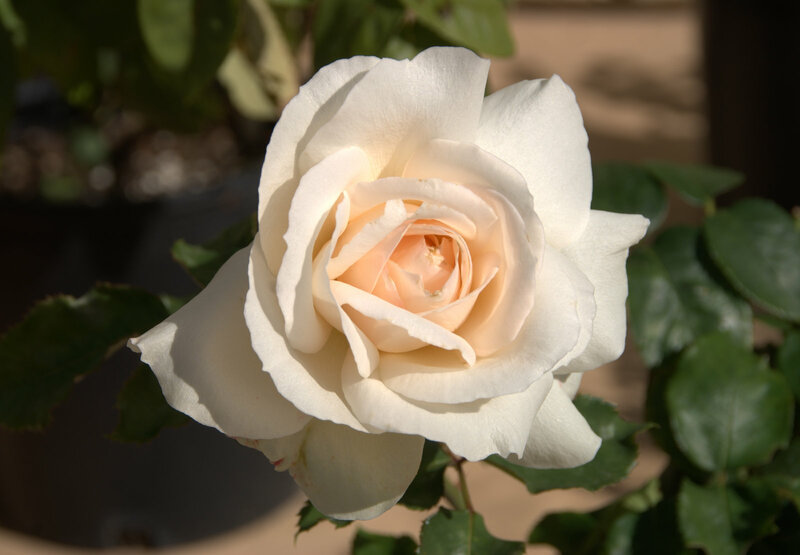 For a Hybrid Tea rose it is remarkably healthy so far and producing very big flowers and in a nice light color. As far as I recall there is a pleasant fragrance to it, too. 'Auckland Metro', here you can see a bloom in a more open state, is another rose waiting in my pot ghetto, but for this one I have already thought of a space in the garden. 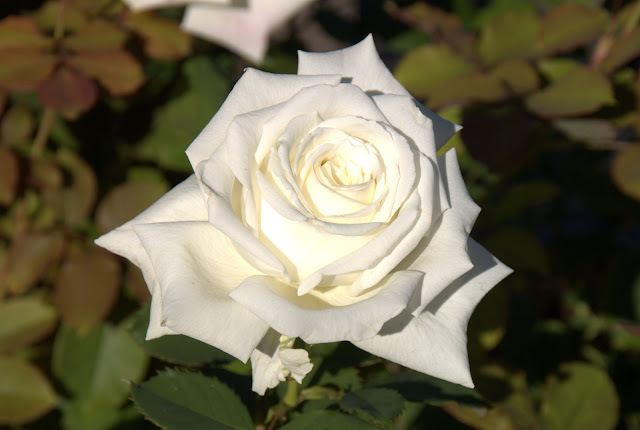 It will replace one of the 'Climbing Iceberg' roses by the pool. I am really looking forward figuring out what it is able to do once it is planted into the ground. This small plonk contained just three blooms of 'Charles Rennie Mackintosh'. It was giving me a lot of pleasure indoors. 'Charles Darwin' gifted me with a humongous soft yellow bloom. 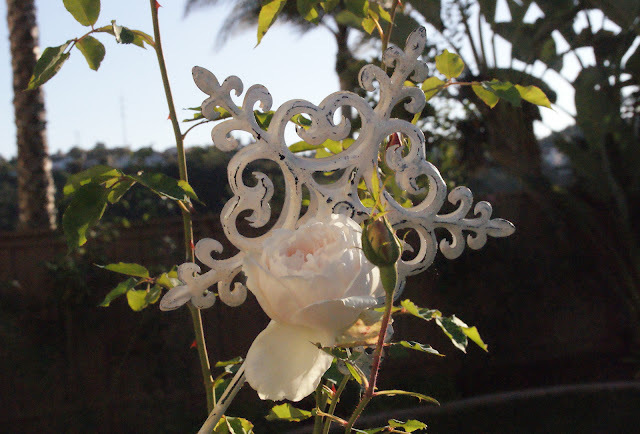 The two rose bushes of this variety that I own don't produce rose flushes at this time of the year anymore, only an occasional bloom here and there. But to make up for that these very few blooms are truly outstanding! I can't praise 'Pope John Paul II' enough in my garden. 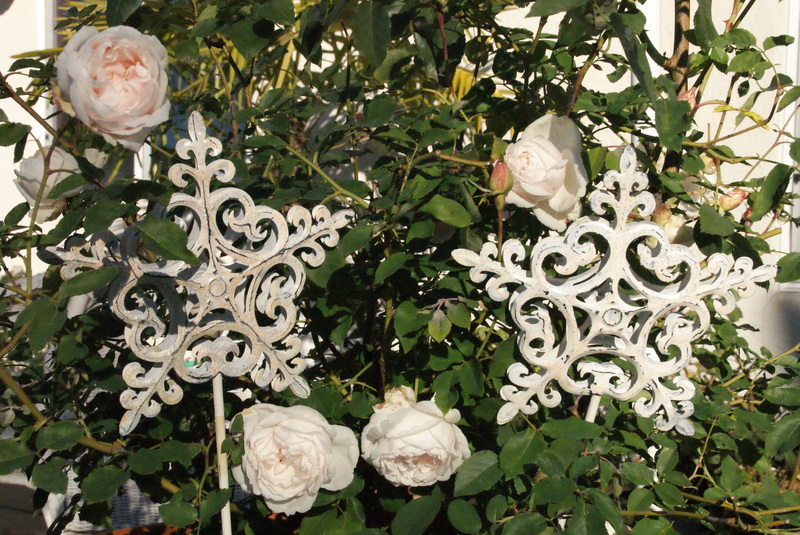 He was giving me another full flush of rose blooms in November and the quality of the flowers was still exceptional like these two photos prove. 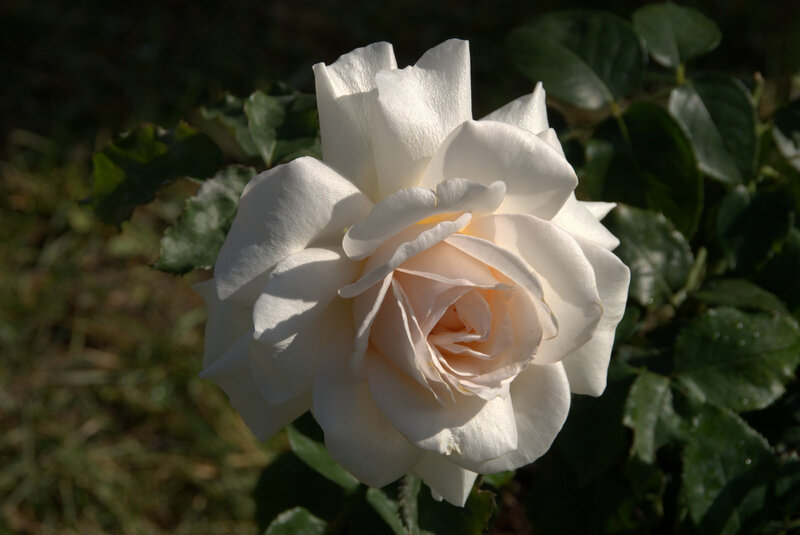 Since we don't have any snow where I live, I love white roses in autumn and winter because at least the color is reminding me of it. Kind of the California take on a white Christmas! Talking about Christmas, I am wishing you all a lovely Christmas season. 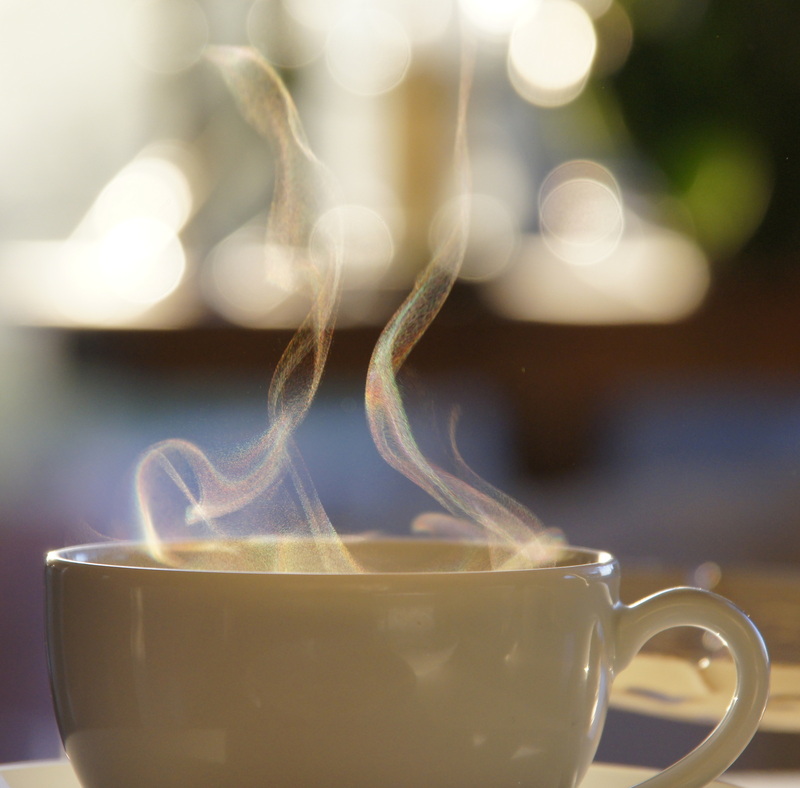 Hope you are able to find some down time to enjoy candles, tea, Christmas cookies, gift wrapping and what ever pleasant things you associate with this time of the year.